The J.W. Ackrill is believed related to the Ackrill family, which founded the Ackrill newspapers and he was also the Honorary Secretary of the rugby club for the 1873-74 season. In the Harrogate Herald Newspaper of Wednesday April 13th 1887 there is a report of a benefit match for Tom Gospel who, at this time is reported to have played for the club for 17 years. The four Fawcetts are brothers and T. Fawcett was Captain for the 1873-84 season. There are 16 players in the photograph and it must be remembered that, at this time, the number of players in a team could be varied up to 20. The Captains before the game would agree the numbers in each team. This allowed for a handicap system when one team was known to be stronger than the other. Moustaches and beards were apparently fashionable at the time. The boots did not have studs but some players would attach strips of leather to the soles to improve the grip. J.Foggo is the club umpire. It is important to remember that the game played in 1871 was different from the way the game is played today. There would be up to twenty players on each side for an international match and uneven numbers on each side for local games. 1871 Founded as Harrogate Football Club. The first match, played on 16th December 1871, was played opposite The Coach and Horses on the area currently known as the West Park Stray. Harrogate fielded 16 players to Leeds 11. Harrogate lost the match. The result was Leeds one goal and five touchdowns, Harrogate 1 touchdown. Four brothers played in the match Frank, Fred, Tom and William Fawcett. This was the only game lost in the club’s first four seasons. 1875 The club played at Dragon Fields opposite where Smiths the Rink is today. 1896 19th December the Harrogate Football Club moves to Claro Road. 1903 Harrogate played Canada at Claro Road losing 5 - 0. 1905 Winners Yorkshire Cup for the first time, winning 7 - 5 against Wakefield Balne Lane 22/4/1905 at Castleford. This was a replay following a 5 - 5 draw 15/04/1905. 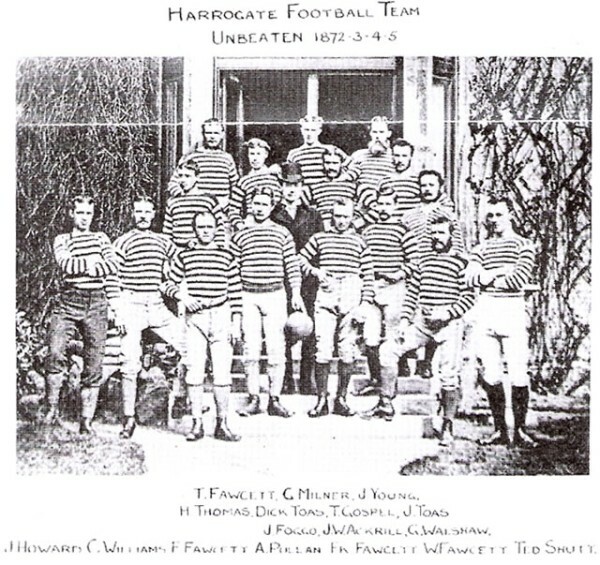 1906 Harrogate Old Boys formed from the HFC 2nd XV. 1907 HFC winners Yorkshire Cup 13/04/07 beating Headingley 11 - 6 at Castleford. 1914 HFC becomes a soccer club. Rugby continues as Harrogate Old Boys. 1928 Claro Road changing rooms opened and considered the best in the county. 1936 Harrogate R.U.F.C. amalgamates with Harrogate Old Boys. 1945 Harrogate Old Boys agree to name change to Harrogate RUFC. 1948 Colts team form under the guidance of Mr. G. Ashcroft. 1949 Winners Yorkshire Cup v Skipton 20 - 6 at Otley. 1957 Harrogate Georgians (Ex Civil Service, St Georges Road) join Harrogate R.U.F.C. name saved for posterity as the second team title. 1963 Claro Road clubhouse opened. 2/9/1963. 1965 Winners Yorkshire Cup v Wakefield 9 - 8 at Otley. 1968 Winners of Daily Telegraph Northern Merit Table. 1972 The Bantams now known as the Mini/Junior section was formed as one of the first in the Country. 1981 Won Yorkshire Cup, Harrogate 12 - 3 Morley. 1991 Winners Yorkshire Cup v Otley 23 - 4 played at Scatchard Lane, Morley. 1992 Winners Yorkshire Cup v Bradford & Bingley 12-7. Division North champions promoted to newly formed League 4. Finished 2nd and promoted. 1993/1994 Division 4 finished 2nd. 1994/1995 Division 3 finished 7th. 1995/1996 Division 3 finished 6th. 1996/1997 Division 3 finished 5th. 1997/1998 Jewson National Division 1 finished 14th. 1998/1999 Jewson National 1 finished 12th. 1999/2000 Jewson National 1 finished 6th. 2000/2001 National 1 finished 5th. Represented Yorkshire in National 7's Cup. 2001/2002 National 2 finished 4th. Won Yorkshire Cup v Wharfedale. Represented Yorkshire in National 7's, winning the competition. 2002/2003 National 2 finished 4th. Won Yorkshire Cup v Doncaster 13-12 at Morley. Runners up in National 7's Cup representing Yorkshire. 2003/2004 National Division 2 finished 8th. 2004/2005 National Division 2 finished 10th. 2005/2006 National Division 2 finished 13th avoided relegation due to league reshuffle. 2006/2007 National Division 2 finished 14th – relegated. 2007/2008 National Division 3 North finished 6th. 2008/2009 National Division 3 North finished 5th. 2009/2010 National League 2 North finished 4th. 2010/2011 National League 2 North finished 6th.